Bike riders of all ages and abilities enjoy opening day of the Truckee Pump Track last year. The Truckee Pump Track Project has been so successful that it has evolved into the Truckee Bike Park Project, which just added jumps. The Truckee Bike Park Project Bash fundraiser will be held at the Cottonwood Restaurant and Bar on Tuesday, April 30, at 6 p.m. Beer and wine are $4, and raffle tickets are $1. Supporters do not need to be present to receive their raffle prize. All proceeds go directly to Phase 2 of the Truckee Bike Park Project — a dirt jump park. If anyone needs evidence that the Truckee-Tahoe area has long since developed into a mecca for biking, take a look at what is happening out at River View Sports Park. 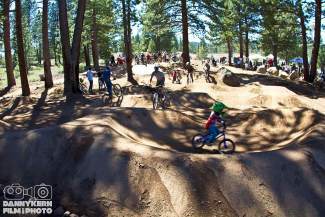 What began over the past two years as the Truckee Pump Track Project, using volunteer support and fundraising dollars to build a dirt pump track near the BMX course just off of Highway 267, has evolved into a Phase 2 — the Truckee Bike Park Project. The new phase of the project is a dirt jump park, located next to the pump track. A total of $45,000 is needed to build the jumps, which is why the all-volunteer Truckee Bike Park Project group, led by volunteers Mark Featherstone and Brooks McMullin, is hosting a fundraising bash on Tuesday evening, April 30, at the Cottonwood Restaurant and Bar in Truckee. “It is the most fun bike party of the year, and all the proceeds go directly to the bike park,” said Featherstone, adding that the Cottonwood will also donate 15 percent of all food sales that night to the project. Phase 2 will be made possible with support from the Truckee-Donner Recreation & Park District, the Truckee Sanitary District and title sponsor Clear Capital, as well as grants from the Truckee Tahoe Community Foundation, the High Fives Foundation and more. The Cottonwood fundraisers — Tuesday’s will mark the fourth one — are also a key component, as they’ve raised more than $15,000 for the project. Beer and wine will be on sale at the Cottonwood for $4, while raffle tickets can be purchased for $1. The band Forget the Roses will perform. “We’re going to have an amazing raffle,” Featherstone said, before estimating the worth of the prizes at $6,300. Featherstone said they hope to break ground on the jump park in early June, about a year after the pump track’s grand opening. And that’s really just the start, as they hope to add flow lines, a cross-country loop and a progression bike skills park in the future, among other upgrades. “Everything you can think of to stuff into a bike part, we put on our master plan,” Featherstone said. For more information, visit the Truckee Bike Park Project on Facebook.